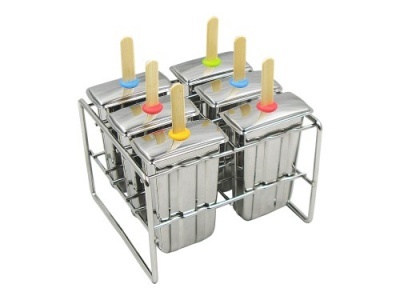 A stainless steel Ice Lolly Mould. Makes 6 lollies at once. Comes with 6 stainless steel moulds, lids, stand, bamboo sticks and silicon rings. Choose style. 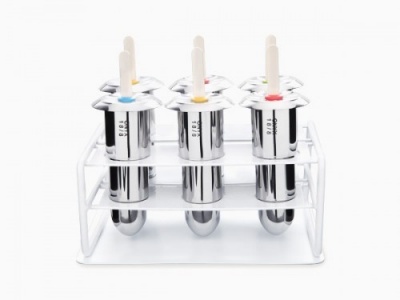 A set of stainless steel Ice Lolly Moulds. 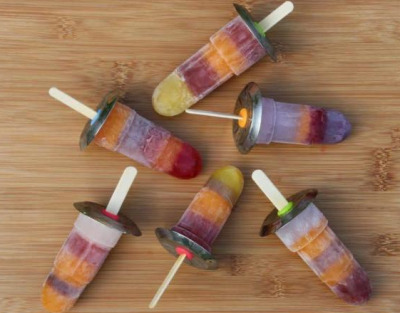 Instead of store bought ice lollies why not make your own? Be in control of your own waste and the ingredients. Made from 18/8 stainless steel (same as Klean Kanteen) non-toxic and non-leaching. This fast freeze mould is easy to use, easy to clean, and will last you a life time. Designed so that one ice lolly can be removed (or re-filled) at a time. Simply hold the mould in your hand for a moment, or dip in room temp water and it will release quickly. Each set comes with one stand, 6 moulds, 6 lids, 12 removable silicone rings, and a set of bamboo sticks. The rings ensure proper stick placement. No more tilted stick, or sunken sticks or popped out sticks. Comes packed in a cardboard box. The item has some plastic packaging inside the cardboard box, which can be recycled at a carrier bag recycling facility(at large supermarkets for example). The product is plastic free.